Mozambique: How Is Mozambique Doing, 43 Years After Its Political Independence? This Monday (25 June 2018), Mozambique celebrated 43 years of independence. It was at the dawn of 25 June 1975, that Samora Machel (1933-1986) announced to all Mozambicans, the proclamation of the "total and complete" independence of the country. While the Portuguese regime lowered the colonial flag, the Liberation Front of Mozambique (Frelimo) vigorously hoisted the flag of the then People's Republic of Mozambique. The birth of a "State of People's Democracy" was announced, in which, "under the leadership of the alliance of workers and peasants, all the patriotic strata of society would engage in the struggle for the destruction of the colonialism aftermath and imperialism dependency; the annihilation of the exploitation of man by man; the building of the material, ideological, politico-cultural, social and administrative base of the new society", as Machel announced in his Independence Speech. One of the most significant changes that occurred in Mozambican politics was the "abandonment" of the socialist project. The civil war that erupted after the independence and later on, the introduction of the Economic Adjustment Programme imposed by the International Monetary Fund (IMF) and the World Bank, prompted (to a large extent) such abandonment. The establishment of neoliberalism, as the dominant political and economic framework, interrupted the industrialisation of the country. The natural resources boom, namely mineral coal, gas, agricultural land and various minerals, has attracted the lust of foreign investors for the extraction of raw material. An "indigenous" oligarchic elite emerged, allying itself with international capital, thus allowing a new configuration in the balance of forces between the state, society and capital. In the last two decades, the country has experienced rapid changes in the political, social and economic spheres. Although its now stagnant economy seemed to be growing at a pleasant pace for a couple of years, the basic functioning of state institutions and the maintenance of essential services never ceased to depend on the "goodwill" of the international donor community, through foreign aid. Today, Mozambique is undergoing a severe economic crisis. This has put the country in a state of vulnerability, allowing the IMF and the international donor community to take advantage of the situation by imposing measures on the Mozambican state. Some call it "interference and disrespect for national sovereignty". Political parties and other small-scaled formations struggle to register or maintain themselves. The political arena is largely dominated by Frelimo - the governing party; the Mozambican National Resistance (Renamo) - the largest opposition party, still militarised; and to a lesser extent, the Mozambican Democratic Movement (MDM), made up mostly of dissidents and discontents of both Renamo and Frelimo. At the moment, the MDM is going through a dangerous crisis, which can put a huge political cost on it, in the upcoming elections - 2018 and 2019. A debate for the amendment of the constitution is on-going, in the Mozambican Parliament. The scenario points to the "bipartisanism" of politics, giving Frelimo and Renamo greater advantage, especially at the municipal and provincial levels. The levels of access to information and freedom of expression have fallen significantly in recent years. The country fell 26 places in the World's Freedom of Press Index. Human Rights Watch describes "an environment of fear" among activists critical of the government, while Reporters Without Borders describes that there is widespread self-censorship among the media. 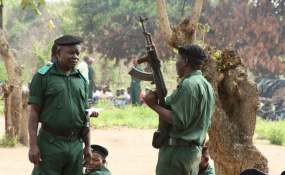 The north of the country is being plagued by a series of violent attacks of disturbing proportions, attributed to a so-called "Al shabaab of Mozambique". Although the government insists on minimising the impact of these incursions, the events denounce the inability of the national security authorities to control the situation. It is not out of the equation, that this may be a resource conflict, a curse of abundance. There is no doubt that since becoming independent, the country has made progress in almost all areas. There are more universities, improved infrastructure, more opportunities, but huge challenges still exist. One of them is the absence of a political alternative that mobilises leftist elements, which exist in several sectors, although scattered. A social and political movement that unifies these elements - popular movements, academia, unions, and non-organisational activism - may be necessary for the development of a popular project that would consider alternatives to save the country from neoliberalism and defend it from the on-going plundering. Until then, Frelimo keeps using its contextual prerogative to perpetuate itself in power, taking advantage of the weaknesses of the opposition and a civil society that increasingly "does not want to debate politics". * Boaventura Monjane is a Mozambican journalist and activist. He is a PhD candidate at the Centre for Social Studies, University of Coimbra, Portugal. * This article was first published in Portuguese by Brasil de Fato, on 25 June 2018. The author would like to thank Miguel De Brito and Cri Essencia for the translation and proofreading of the article.